協會並沒有足夠的空間能夠收容每隻需要救援出來的受虐動物，因此領養小站對協會來說是一個很重要的角色。台灣大部份的收容所都在遙遠的郊區，不方便的地點及時常不乾淨的環境使領養率無法提高。我們希望因此可以顛覆以往民眾對於流浪動物的刻板印象，並讓大家知道我們在送養的動物可以是很健康乾淨的。領養小站內一次可放置2-3隻動物，而且時常會有不同的貓狗輪流入住。而小站內的動物也都會經過獸醫檢查並施打疫苗及結紮才入住。小客廳寵物旅館 The Living Room Pet Hotel 便是TSPCA合作領養小站的其中一間，就讓我們來看看他們的經營理念以及他們是如何用心照顧動物吧! Taiwan Legislator & #BeCrueltyFree Taiwan Launch Bill to End Cosmetics Animal Testing. ​最新一篇調查員日誌發布囉!! 我們熱情又可愛的實習生親自寫下她的 "動保專員-實習生心得" !!! 熱血想幫助動物但不知該如何踏入動保領域? 想知道當TSPCA調查部門 -動保專員的實習生是什麼樣的心情嗎? 實際的工作內容嗎? 好奇的話, 快點進來看看唷! 台灣防止虐待動物協會（Taiwan SPCA） 於七月初向台中市動物保護處檢舉一起虐待案件，關於飼主在麥德姆颱風時惡意將家犬綁在外面，使狗狗面臨任風吹雨打及颱風帶來的危險性，但飼主完全不理會。 調查期間，飼主多次不回應及故意忽略動保處的勸導，敷衍的態度公然挑戰公權力及主管機關對動物福利的標準。但令動保團體訝異的是，身為第一線保護動物的主 管機關竟默默接受飼主完全沒有改善飼養環境的事實及毫無悔意的態度 ，讓本協會不禁質疑，台中市動物保護處到底保護的是動物還是惡劣飼主? Come Read Our June Newsletter! Did you know？Stereotypical Behavior often effects wild animals who are kept in captivity because of stress and the inability to express their natural behavior and their lack of environmental control. This stress is shown by stereotypical behaviors such as：pacing back and forth, self mutilation, over grooming, rocking or swaying in one spot, head bobbing, bar biting, repetitive behaviors, and severe apathy. Keep reading by checking out our June Newsletter! 替面臨絕種的石虎發聲 Speak Up For Endangered Leopard Cats! [震驚] 為了一個 "好價錢"， 業者及消費者對於 "尊重生命" 的價值觀去哪了? 你有問過 "牠" 願不願意嗎? It's Valentines Day! Haven't found your Valentine yet? Are you lonely and still searching for 'the one'? Single Ladies and Gents, your soul mate could be waiting for you here at the Taiwan SPCA! Interested in more single ladies or gents? Come find your future companion here! Recap on 2013! Report on What the SPCA has Accomplished in 2013! ​ICRT's China Watch interviews the Taiwan SPCA about issues regarding large breed dogs being kept in cities and small apartments. Listen to the English interview below. The fourth annual SPCA Charity Gala was a great success! Big thank you to all our wonderful sponsors, performers, and to the 270 guests that came out to support a great cause. Have a look at photos from the night, we hope everyone will continue to support us next year! Thank You! ICRT's Eryk Smith interviewed the SPCA about animal welfare issues in Taiwan and what can be done to improve the current problems. Listen the the English interview below. As MP Alice Wong's eating of shark fin soup continues to draw condemnation and criticism from Richmond and around the world, two other interested parties have agreed to take part in a public forum.Wong has caused uproar in her home constituency after posing in front of Chinese-speaking media with a bowl of the controversial soup, stating the federal government has no intention of banning shark fin products, despite some scientific evidence pointing towards certain species being endangered.....The Taiwanese SPCA also railed against Wong, saying that she does not speak for Asian people or its culture when it comes to the issue of shark fins being used for the likes of soup. 羅志祥 與 Taiwan SPCA 狗狗支持 PETA! 阿雅與Taiwan SPCA 的 Back 2 Basics 宣導影片出爐啦! 虐待動物有好幾種﹐而我們不僅須要推廣正確的飼養寵物觀念﹐政府與大家對於什麼是 "動物虐待" 的標準也應要提高。列如: 很多台灣人養狗就是長期把牠綁著當看門狗。雖然沒有違法但是長期忽略狗狗很容易造成他們身心靈的創傷。長期將狗狗關籠子﹐騎大象﹐看馬戲團﹐購買具有動物 實驗的產品等﹐都是虐待動物行為! 阿雅與Taiwan SPCA提醒您﹐不要成為動物虐待者! PS: 影片也可以在博彩廣告的戶外媒體螢幕看到喔! 地點: 西門紅樓旁 & 和平東路一段 (古亭捷運站旁)! The message we hope to portray in this video is that "Animal abuse comes in many different forms. Please do not become an animal abuser". We hope everyone can help us spread the message! 有美女攝影師之稱的Mia 也是愛狗人士! TSPCA 是去年拍攝 "貓嬤紀錄片" 時接觸到Mia並感覺到她對於動保的熱誠。今年Mia 決定將她攝影展的寵物照片提供給協會拍賣﹐並將全額捐給TSPCA. 感謝Mia 的愛心! 希望大家可以大量支持購買可愛的照片-掛在家裡會很棒喔! Big THANK YOU to our 260 guests! SPCA 2012 Charity Gala raised $874,735 after expenses. The funds raised will be used towards our Educational Curriculum/Tour & Animal Cruelty Investigations Department! 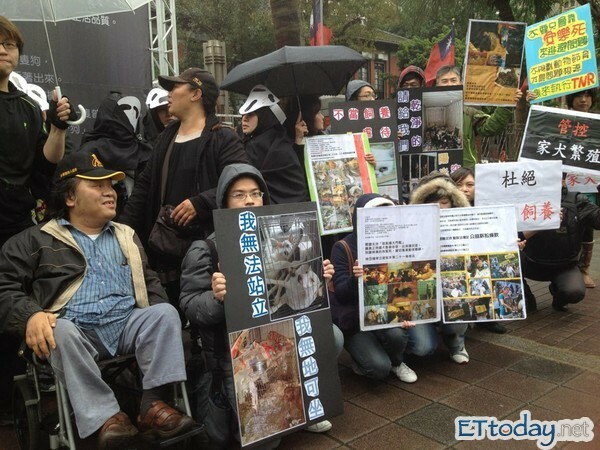 2011世界動物日 Taiwan SPCA擔任台灣區大使! We are the World Animal Day Ambassadors! We're honored to be asked by the World Animal Day (10/04) organizers to once again be the 2011 WAD ambassador for Taiwan. This special annual event is meant for everyone around the world to celebrate all animal forms and to thank all the animals that have enriched our lives. Ambassadors around the world will be organizing different events with local groups to celebrate this special day. Please check back to the website for Taiwan SPCA World Animal Day events! 郭泓志 "向虐待動物行為說NO" Hong-Chih Kuo of the L.A. Dodgers "Say NO to Animal Abuse"
The magazine interviews two Co-founders of the Taiwan SPCA, Connie and Annie Chiang. In the article the two talks about why starting the Taiwan SPCA was like a dream come true, what the Taiwan SPCA's goals and obstacles are, and the current situation of animal welfare in Taiwan.